We have a new toy. Have you heard of AppleTV or ChromeCast? Well, we have both of those also, and we use them at home to project our phone or our iPad’s screen to our TV, but they don’t really do what we want in a seminar presentation situation. 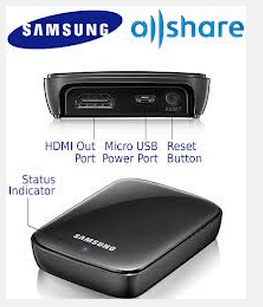 Jim just got the Samsung AllShare Wireless HDMI Display Adapter. 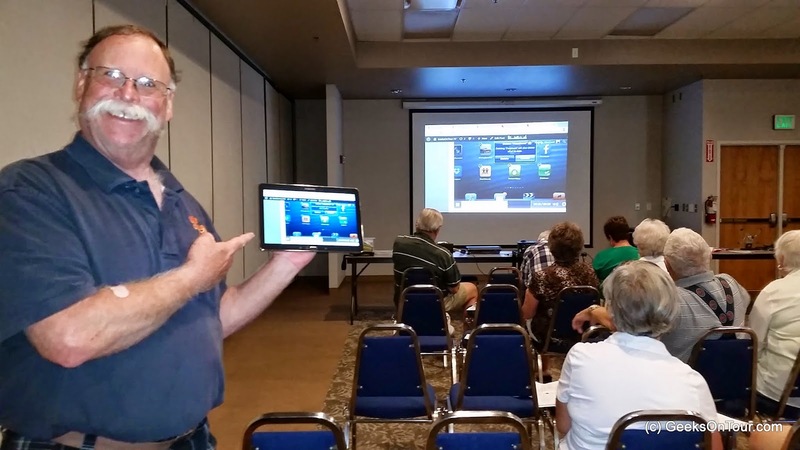 So, as long as the projector has an HDMI port, we can be standing anywhere in the room with either our Samsung phones or tablet and whatever we’re seeing on the tablet is being projected to the big screen. Our powerpoint presentations work on the Samsung tablet, we can show web pages too. But my favorite part is that we can tap the camera app on the tablet, then we’re seeing – and the audience is seeing – whatever we’re focused on. So … we can stand next to a student who has a question on their iPhone for example, and we can focus on their phone and their hands – as we step them thru the answer to their question, everyone else in the room is seeing it too! I love it. Published by MrsGeek, in Blog. Tagged with Project Smartphone or Tablet, Samsung.